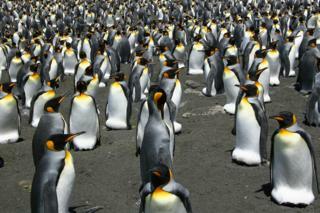 King penguins are in deep trouble if nothing is done to constrain climate change, researchers say. The scientists have assessed the birds' fragmented population in the Southern Ocean and concluded that some island strongholds will become unsustainable. The problem is the continued movement away from key nesting sites of the penguins' favoured foraging grounds. And as the climate warms further, food will simply become too distant for many birds to fetch for their chicks. "Our work shows that almost 70% of king penguins - about 1.1 million breeding pairs - will have to relocate or disappear before the end of the century because of greenhouse gas emissions," said Dr Céline Le Bohec from the French National Centre for Scientific Research (CNRS) and the University of Strasbourg. Her team has just published its findings in the journal Nature Climate Change. The group has looked at the particular requirements of the king penguin and how shifts in the environment might affect the species' breeding success in the coming decades. It is a mixture of climate modelling but also uses genetics to understand population history, as well. The second largest of the 17 penguin species, Aptenodytes patagonicus are finicky about where they base themselves, preferring sub-antarctic islands that are free of sea-ice and that have smooth sandy or pebble beaches on which to rear chicks. But they also need a good supply of fish and squid, and in the Southern Ocean this is to be found along a feature known as the Antarctic Polar Front (APF). It is a nutrient-rich upwelling that supports abundant prey for the hungry predator. The issue is that the APF is heading poleward, and if global temperatures continue to rise as expected, the front is likely eventually to move out of the range of many foraging king penguins, the research suggests. Seven hundred kilometres is about the limit at which the birds can travel and not expose their chicks to starvation back at the nest. "Marion and Prince Edward islands, and Crozet island will have the biggest difficulty in the next 50 years, I would say. These are major population centres," Dr Le Bohec told BBC News. "But if we continue with the addition of greenhouse gases then Kerguelen, Falkland and Tierra del Fuego islands will also have difficulty." By analysing the genetics of the birds, the scientists can see that king penguins have suffered population crashes in the past, most notably about 20,000 years ago when colder conditions extended the sea-ice much further to the north than it is today. So there is evidence that the birds can bounce back, and the team's modelling indicates that they will very probably try to adapt to their changing circumstances by colonisation Bouvet Island, and by increasing their numbers on Heard and South Georgia islands, which should benefit from improved foraging conditions as the APF edges ever poleward. "The problem is the pace of change. It is really very fast, and that will make it hard for the penguins to adapt," said Dr Le Bohec. Commenting on the study, Dr Norman Ratcliffe from the British Antarctic Survey confirmed that shifts in the APF were a very important factor for king penguins. Independent tracking and breeding success data from Crozet and Kerguelen showed that the birds failed to breed in those years when the front temporarily moved too far south, he told BBC News. "Long-term projections of the type presented here are always crude caricatures but I like this study because it does take a more mechanistic approach based on the known habitat requirements of the species rather than using a more traditional and simplistic thermal envelope model," he said. "For the time-being we know king penguin populations are still increasing across their range, probably due to them recovering from hunting pressure during the sealing era. "So while it is possible that reduced accessibility of foraging habitat might cause loss of northern colonies in the future, there is no evidence that we have yet reached a tipping point at which this occurs."